North Safety Com-Fit has been discontinued by the manufacturer. Tasco Tri-Fit ear plugs are a direct replacement for Com-Fit. Tri-Fit even has the same NSN numbers. Best of all, Tri-Fit ear plugs are produced to the same specifications, so you know they will serve you perfectly -- and at a lower price! Tri-Fit Triple Flange Reusable Ear Plugs feature three thin, soft and flexible flanges on each ear plug. With this triple flange design, and available in three sizes, Tri-Fit ear plugs fit virtually everyone perfectly. The sizes are indicated by color: green for small, orange for medium, and blue for large, so you can quickly and easily see which size you are getting. Tri-Fit Reusable Ear Plugs are available in poly bags with cords and without cords, in three different sizes. (NRR 25) North Safety Com-Fit has been discontinued by the manufacturer. Tasco Tri-Fit ear plugs are a direct replacement for Com-Fit. Tri-Fit even has the same NSN numbers. Best of all, they are produced to the same specifications so you know they will serve you perfectly and at a lower price! Case of 400 Pairs - Best Pricing! Tasco Tri-Fit Triple Flange Reusable Ear Plugs, Corded in Poly Bag (NRR 25)5Felicia HarrisJuly 18, 2018I normally use 'Com-fit' earplugs to meet employee(s) needs with small ear canals, but Com-fit stopped carrying the smaller size a few years ago. Trully glad I came across these plugs. They are perfect and well received by the guys. A "Perfect Fit" indeed. 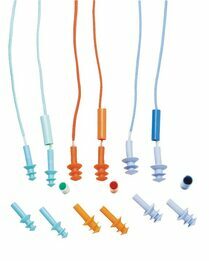 Tasco Tri-Fit Triple Flange Reusable Ear Plugs, Corded in Poly Bag (NRR 25)5BetsySeptember 1, 2017I've been searching the web for months trying to find a small (very small) reusable earplug for an operator in our facility. After purchasing several without success, I stumbled upon this item. She has extremely small ear canals & finally "a perfect fit". Thank you! Tasco Tri-Fit Triple Flange Reusable Ear Plugs, Corded in Poly Bag (NRR 25)5Sheldon ThomasMay 5, 2016I have used several different styles of ear plugs and these have the best combination of convenience, comfort and effectiveness. A film of Vaseline applied adds significantly to ease of insertion. Tasco Tri-Fit Triple Flange Reusable Ear Plugs, Corded in Poly Bag (NRR 25)5MARTYFebruary 17, 2014I use to use nothing but com-fit earplugs in this style but couldn't find them anymore. Tasco actually improved on the original with a better cord and the same comfortable fit. My order was sent in a timely manner and customer service was excellent ! Tasco Tri-Fit Triple Flange Reusable Ear Plugs, Corded in Poly Bag (NRR 25)5JoseMay 10, 2013These earplugs are perfect. Since I have large ear canals it was difficult to find the right ear plug size. I will be ordering more once I run out. Thanks for the great service and speedy delivery.